I just had to share this cause I love how it looks. 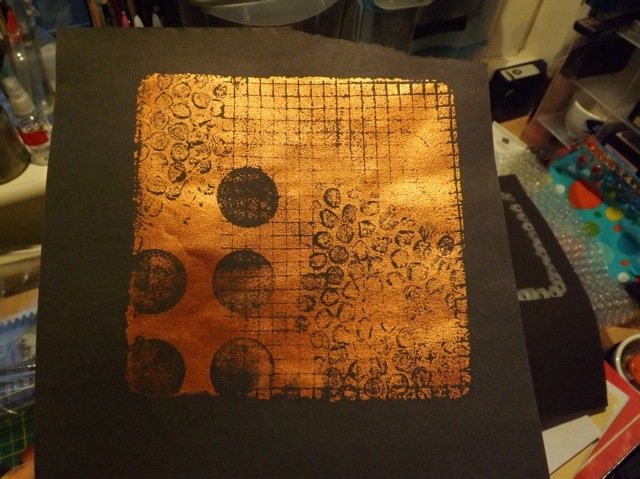 Copper acrylic paint on black paper. I am so going to have a long play with this – I have silver, gold, and pearl., Yippee! 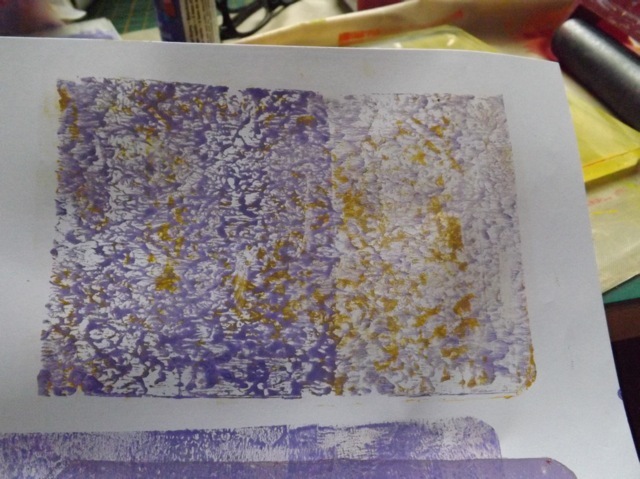 I really want to play with mixing up the metallic paints with colour in layers cause I just know it is going to be cool. Man I wish I had this when I was working on the BIG CARDS. I was anxious to get an order, and it came quite quickly so that made me happy. 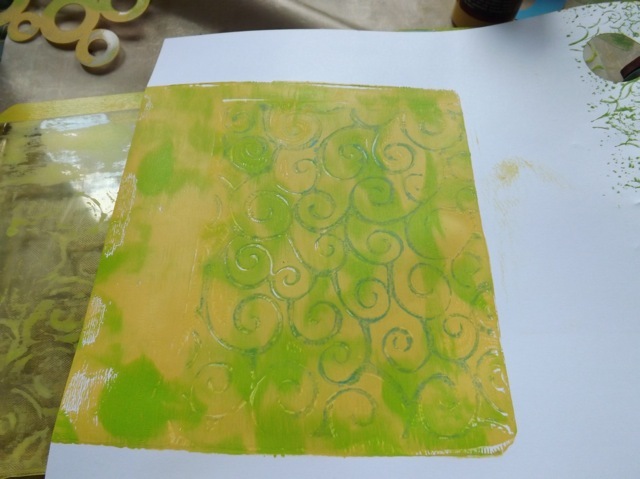 I have been thinking of getting a Gelli plate for ages because I had an idea that I thought would work and really wanted to test it out. 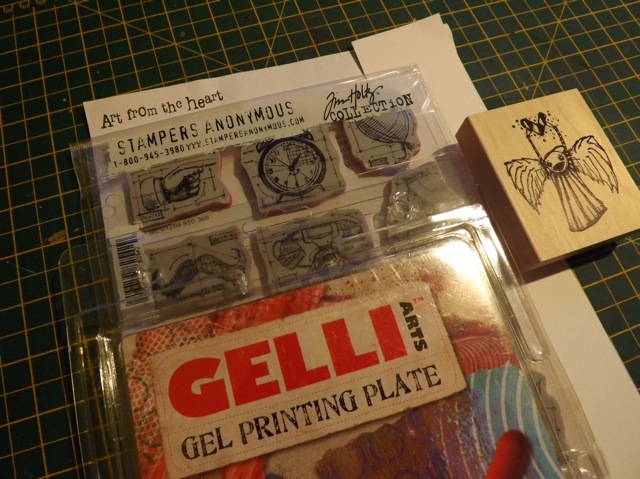 But shopping is something I don’t do a lot so when I decided I just HAD to have some of Tim’s stamps and one of the Stampotique ones I have wanted since it came out, I finally sat down to order them. 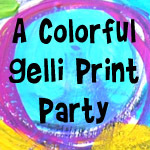 And there was a Gelli plate on AFTH too, so I let it slip into my basket. I decided to take a break from my organizing, while I worked on UKS stuff this AM, but the plate was calling to me. I just had to test my idea! And it worked! Now, as is my way, as soon as I come up with something that I THINK is innovative, I check out the web to see if it is actually old hat. Not old hat, but I did find someone (journal Artista) who had done my first idea already (but just a couple of weeks ago) – you can see her video here. It works exactly as I expected it to and her samples are lovely. 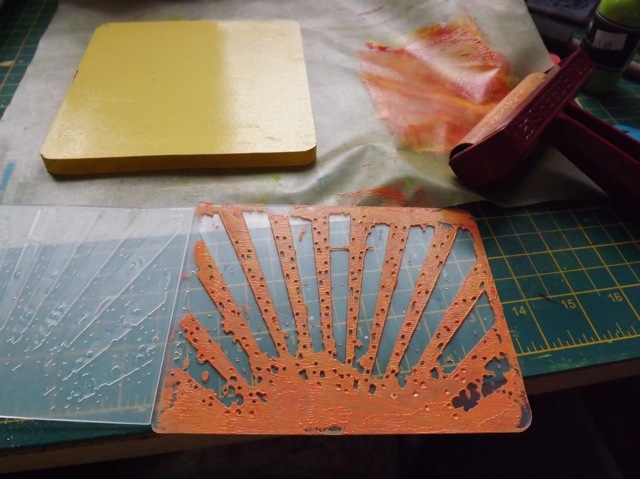 But that still left me with another idea to try with the embossing folders. 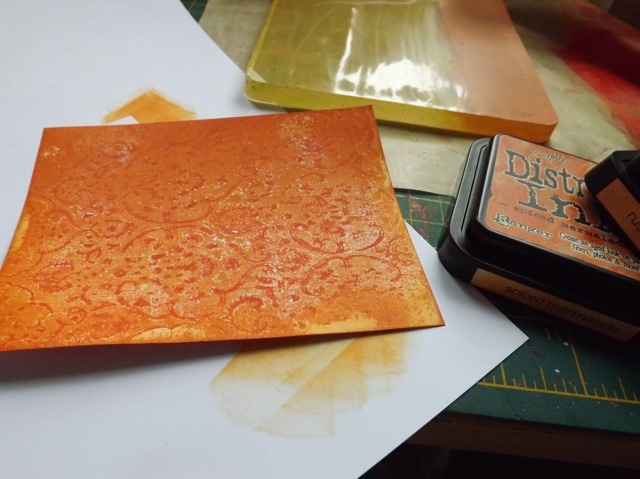 If you read here often, you know I am always brayering stuff on my embossing folders, so …. 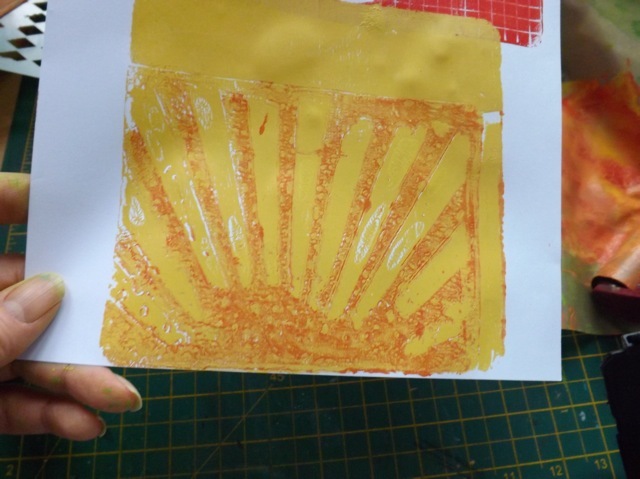 The print was interesting but I think it is quite hard to keep the paint (and I am using cheap acrylics, not slow drying ones) wet while juggling the brayer, the folder AND a camera to capture the process! 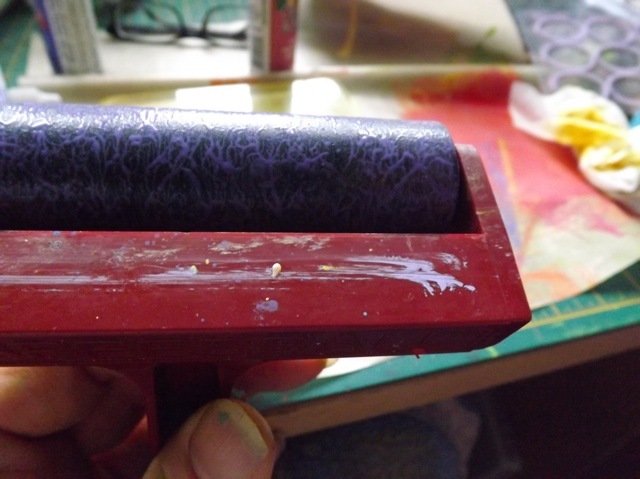 It’s blotchier than later samples, where I misted from a great height a bit of water to keep the paint moist. I tried a few different folders, with varying success. 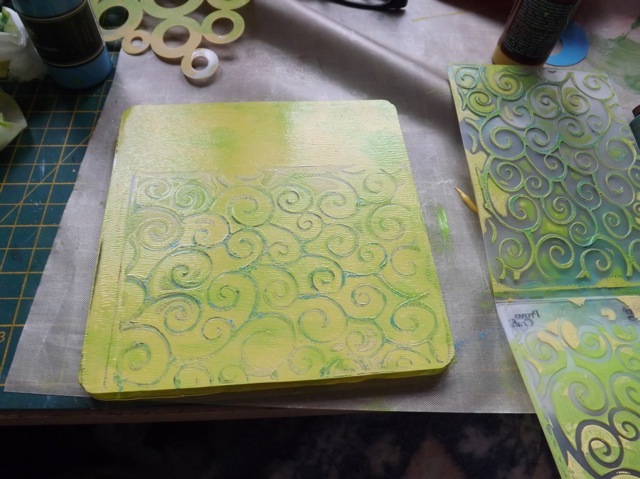 I think on this one I had the base layer of paint too thick. 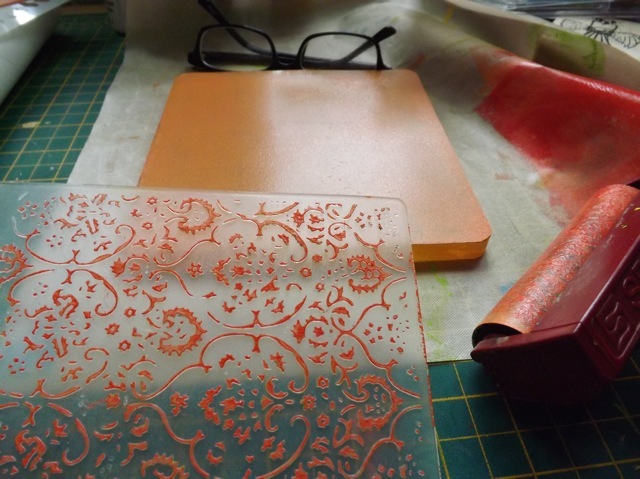 And I tried both the emboss and the DEboss sides of the folder, which gave different effects. 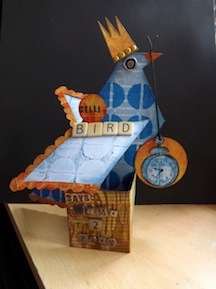 That is quite possibly my favourite example – I’ve cut it to make a card from. I think the higher the contrast between your two paint choices the better, although not every combo works. 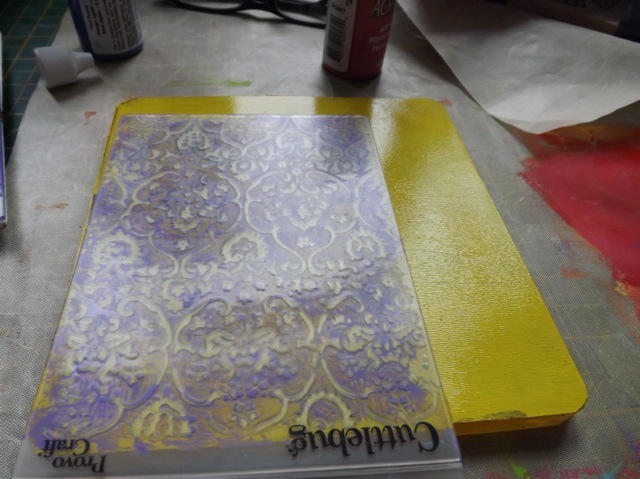 The yellow and purple got a bit muddy for my taste, and the purple paint was really old and needed more shaking than I gave it. 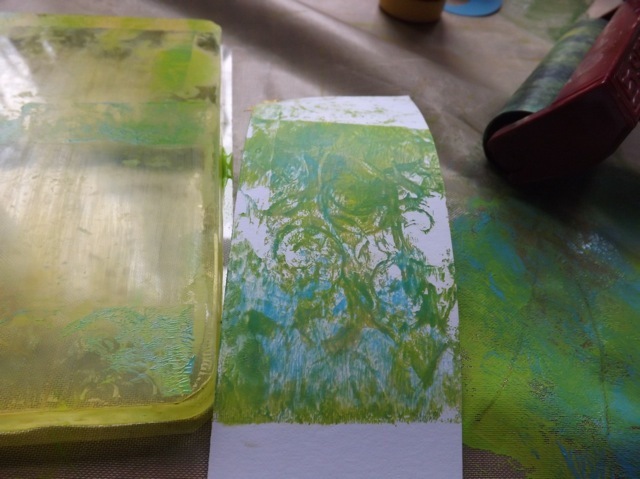 But another interesting thing – after you brayer the paint on to the embossing folder, there is a pretty nifty bit of texture on the brayer. 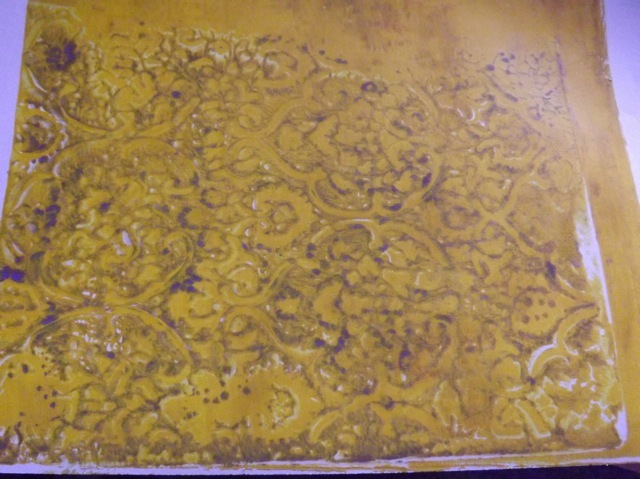 From the last sample, I did more a single pass so I was retaining the texture a bit better. Worth playing with some more, I think. I really have to get back to work, and I still have more cleaning and organizing to do so I will have to save further play and more samples for later. 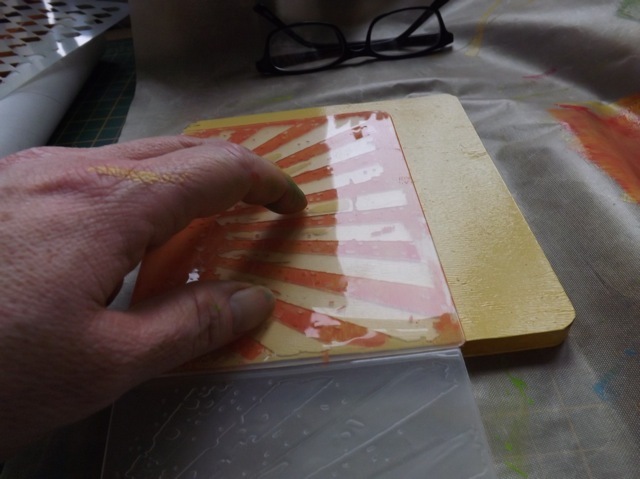 I am keen to try this out with layered printing, and at least one of the samples shows promise, but I need to refine the process before I share. I can see this being a huge amount of fun, and already thinking I may need the bigger plate. DOH! 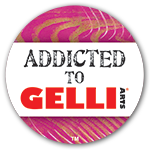 Categories: art, Gelli plate monoprints | Tags: art techniques, Gelli plate, monoprinting | Permalink.